Use a negative radius to put text on the inside of a circle. Use a positive radius to put it around the outside. DeskEngrave is a free Windows program that makes it easy to add engraving to your parts if you have a CNC mill, router or similar machine. It will create text using any TrueType font installed on your PC, make it the height or width that you specify and put it on a straight line or wrapped around a radius. 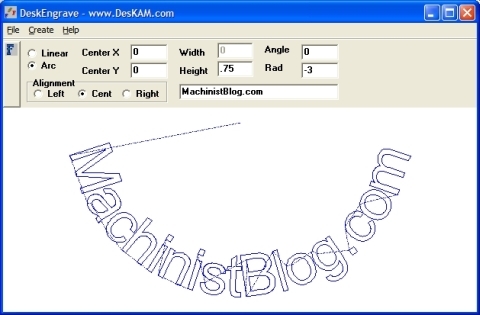 It will also create a DXF file or generate G-code that you can run directly on your machine. You could also use it to make cut-out, raised or pocketed text, although you’ll need the help of a CAM program. That’s how I’m going to use it to make street numbers for my mailbox. You can also import its DXF files into a CAD program if you want to create multiple lines of text or add them to another design. The program couldn’t be much easier to install and use. It seems to work very well but there are some things you should know. The size of your text appears to be controlled only by the height and width boxes on the main screen. Even though you can change the font size on the font selection menu it doesn’t seem to make any difference. I’ve also noticed that the size of the text is often significantly bigger than what I specified. So if size is critical you might want do to a test run and either adjust the size until you get what you want or rescale the DXF with a CAD or CAM program. You can specify only the height or width of your text, not both. You also need to set the parameters before you try and run the G-code it generates, otherwise your controller program will probably complain about a feed rate of zero. Also, the “Precision” and “Dec. Places” settings are important. I don’t know what the optimal settings are yet, but if you don’t the increase the default settings your font will look like it’s made entirely from straight lines instead of curves. Click on the help button for more information about those settings. DeskEngrave is from Deskam.com, which appears to be part of DeskCNC, a maker of CNC software and controller boards. The program hasn’t been updated since 2000 but this CNC newbie thinks it is still pretty useful. Soy un aprendiz de usuario de esta excelente herramienta. Sin embargo , no encuentro la forma de generar textos invertidos a espejo. Lo que en algunos programas se llama “MIRROR”. Muchas gracias por toda posible orientación o ayuda. DeskEngrave is a very simple program and I don’t think it can create mirrored text. Me pregunto si habrá alguna otra alternativa de soft para hacerlo. Es decir, GENERAR UN TEXTO REFLEJADO Y LUEGO, BAJO DXF , VECTORIZARLO PARA PRODUCIR EL CÓDIGO G.
Hi got my sherline cnc mill 2001. Downloaded deskengrave from Internet worked easy but every thing was mirror image.Recently computer crashed so sherline sent me new 6.0 version Linux & emc2 also deskenGrave.Now I can’t get deskenGrave to give me a program that will work ! No modal or non modal codes in program!How do set it for sherline emc2! StickFont also allows you to easily add a header or footer to the G-code, which may be helpful if want to use the G68 or G50 codes that Brian Barker recommended in my first link. I control my mill with Mach3 and I haven’t had any problems using DeskEngrave. I have to admit that I still haven’t gotten around to trying StickFont. can you please tell me if the files can be saved as a NCD file. i have a Techno isel GCode interface for DaVinci & C-Series Controllers Window version. It can save the G-Code and the image as a DXF file. Sorry, it can only save the image as a DXF file and G-Code. Does DeskEngrave handle multi-line engraving? Can you import a .dxf file into it? Where do you actually see the G code program,Ive got it working but cannot see the program….? Travel is fatal to prejudice, bigotry and narrow-mindedness.